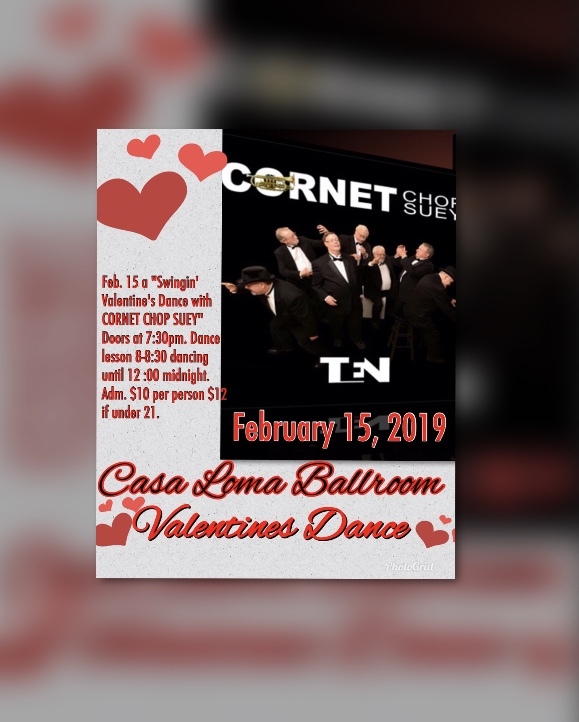 Celebrate Valentine’s Day with your special someone and all of your friends, at Casa Loma Ballroom and swing dance to CORNET CHOP SUEY. This is the first time they have played in this historical ballroom. Cornet Chop Suey applies it’s own exciting style to traditional jazz, swing, blues and “big production” numbers. Every performance is a high-energy presentation ad is always a memorable dancing experience for the audience. Check out their website and hear some great tunes at www.cornetchopsuey.com Doors open at 7:30pm. with a complimentary swing dance lesson from 8:00-8:30. then dancing until midnight. Call 314-664-8000 to make a reservation. Admission is $10 per person / $12 if under 21. Special Valentine’s drinks.